Abidali Mohamedali., et al. Cross Species applicability of Anti-human plasma IgY affinity column. (2016) Cell Immunol Serum Biol 2(1): 34- 38. © 2016 Mark S.B. This is an Open access article distributed under the terms of Creative Commons Attribution 4.0 International License. In order to improve the sensitivity of proteomic analysis, our group has developed a chicken antibody based column that has successfully depleted high abundance proteins (HAPs) from human plasma prior to mass spectrometry analysis. The use of chicken as a host for polyclonal antibodies production conveys many advantages, including but not limited to, the capabilities of producing large quantities of IgY antibodies with minimal antigen quantities and enhanced immunogenicity exhibited by their immune systems against foreign immunogens. In this study, we explored the ability to use an anti-human IgY affinity column with a variety of plasma samples derived from different animals and demonstrate this column’s ability to deplete the two most common HAPs (albumin and immunoglobulins) reproducibly in phylogenetically related species. Hence, our study highly recommends that IgY-based immune depletion technologies could be used to capture targeted proteins among phylogenetically related species without having to produce separate columns for each clade. The presence of high abundant proteins (HAP) in complex, readily accessible bio-fluids (e.g. plasma, urine, and CSF) makes the discovery of low abundance markers of biological and cellular function in these samples very difficult. Human plasma represents the largest and most comprehensive version of the human proteome and has been the subject of intense study as itcontains a snapshot of the biological functions or malfunctions in the body. It is a highly complex protein mixture dominated (over 99.9%) by a small number of highly abundant proteins such as albumin, transferrin, haptoglobin, immunoglobulins and among others. Although these abundant proteins could be used as potential biomarker candidates, the greater efficacy and in-depth view of the status of an individual lies in the remaining 0.1% of proteome represented by tissue leakage markers, inflammatory response markers, apoptosis and cellular damage markers, signalling markers. The removal or reduction of the HAPs has been a subject of intense research in the past decade with numerous techniques being investigated for their effectiveness and efficacy to capture these proteins[4,5]. Several immune depletion columns are commercially available to deplete as many as 20 of the most abundant human plasma proteins (MARS-14 from Agilent Technologies and ProteoPrep® 20 from Sigma Aldrich). The research and development phase of an immuno depletion column is usually time-consuming and costly. It involved the production and purification of antibodies (polyclonal or monoclonal) against every targeted protein, followed by extensive testing and validation. These immune depletion columns are often relatively specific and hence incapable for use on other animal species. The prohibitive costs of manufacture coupled with a significantly lower investment/demand to produce animal specific immunodeficiency columns has the potential to hinder commercially viable biomarker discovery projects targeting livestock diseases and health (especially cows, goats, pigs and sheep), endangered wildlife protection studies (especially of primates) and a pest control measures (such as that of the cane toad). Chicken antibodies in recent years have been seen as a viable alternative to the use of mammalian antibodies in the research setting due to various factors not limited to the ease of accessibility (from eggs) and extraction, the ease of storage of IgY antibodies and their inertness in reactions with thefragment crystallisable regions (fc) and rheumatoid receptors. In addition, chicken antibodies are thought to be superior to their mammalian counterparts in their specificity; as the phylogenetic distance of chickens to humans (which is the focus of most medical research) is large, their stability; they can be stored for extended periods at room temperature, their ease of extraction; they are easily extracted in large quantities from eggs non-invasively, and the cost to produce them is a mere fraction. One of their most effective uses is in the depletion of HAPs from a range of different bio fluids including plasma[10,11], plant cell extracts and urine. We have demonstrated the use of chicken antibodies to immune deplete highly to moderately abundant human plasma proteins using tandem ion-exchanged fractionated plasma to produce polyclonal IgY which were then immobilised and packed onto a column (Abundant Protein Immuno depletion- API). In this study, we explore the feasibility of using this human plasma immune depletion column to deplete plasma from other animal species. This cross species applicability of such columns could potentially make plasma immune depletion columns far more accessible than they currently are for a wider variety of research projects. All plasma samples utilized in the study were obtained from animals with no reported disease. Human plasma (B group, Rh positive) was donated by the Australian Red Cross Blood Service with informed consent of the donors. Bovine plasma (GTX73201), rat plasma (GTX73231), rhesus monkey plasma (GTX73284), chicken plasma (GTX73211), porcine plasma (GTX73220) was purchased from Gene Tex Inc. (Irvine CA). Donkey plasma (IDK-N) was purchased from Innov-Research, Inc. (Novi, Michigan). Tammar wallaby plasma was kindly supplied by Dr Kiran Ambatipudi (Macquarie University). Crocodile plasma was supplied by Dr Sally Isberg of The Crocodile Farm NT, Australia. Cane toad plasma was supplied by Dr Damien Halliday (CSIRO Department of Entomology) whilst duck plasma was supplied by our colleagues from the University of New England. The abundant protein immune depletion (API) column prepared as described previously was used in this study. Briefly, fractionated pooled normal human plasma using a protein repetitive orthogonal offline fractionation (PROOF) methodology were injected into chickens to generate antibodies in the egg yolk. The IgY antibodies were then purified immobilised on beads, and packed to produce the API column.For this studyanimal plasma was quantified and 2.7 mg of protein was diluted in 5 ml of PBS and sterile filtered through a 0.22 um syringe filter. The resulting was injected into apre-equilibrated API column at 1 ml/min to allow binding using an AKTA protein purification system (GE Health Sciences). The column was then washed with 2.5 CV (1 CV = 20 ml) of PBS, first at 0.05 ml/min for 3 min, then at 5 ml/min. The bound proteins were eluted with 4 CV of glycine buffer (100 mM, pH 2.5) at 5 ml/min and the column re-equilibrated with 5 CV of binding buffer (PBS) at a flow rate of 5 ml/min. Proteins being passed through the column were detected with an inline UV protein detection lamp set at 280 nm. Proteins collected from the column (flow-through and API-bound) were then concentrated by ultrafiltration through a 3 kDA cut-off Amicon-15 (Millipore) spin column and the proteins quantified by mico BCA (Pierce). Approximately 10 μg total proteins were separated on a 4 - 12% bis-tris pre-cast gradient gel with MOPS running buffer (Invitrogen) as per the manufacturer’s instruction. The gels were then fixed, stained overnight with Flamingo Pink (BioRad) and imaged on the Typhoon Trio Variable Mode Laser Imager (GE Healthcare) with photo multiplier tube (PMT) voltage set to 5V below saturation of the most intense spot. Microtiter plates (Corning Life Sciences) were coated with 100 μl of 4.8 μg/ml animal plasma in 50 mM carbonate-bicarbonate buffer, pH9.6 (Sigma). After incubation at 4°C overnight, the plates were washed three times with wash buffer (PBS). Non-specific binding was blocked with 200 μl of 3% skim milk powder (local supermarket) and with 60 min incubation at 37°C. After washing thrice, the anti-human IgY was diluted to 100 μg/ml with 3% skim milk buffer and added to the wells (100 μl/well). Plates were incubated for 90 min at 37°C and then washed. The secondary antibody, HRP-conjugated rabbit anti-chicken/turkey IgG (Invitrogen) was diluted to 1:20,000 with 3% skim milk buffer and added to the wells (100 μl/well) for 60 min at 37°C. After washing to remove residual antibody, bound antibodies were detected by the addition of 100 μl of tetramethyl benzidine liquid substrate (Sigma) for 10 min at room temperature. The reaction was stopped by adding 100 μl 1N sulphuric acid (Merck) and absorbance was measured at 450 nm. For statistical analyses, analysis of variance was determined using a Student’s t-test. A maximum 2-tailed probability value of 5% (p < 0.05) was considered statistically significant. All ELISA analysis was performed in triplicate to verify consistency of results. Similarly, all chromatography, protein quantification and detection was done in triplicate and statistically analysed as described above. The animal plasma proteins were depleted using an anti-human plasma IgY-based immune depletion column, called API column. Our results demonstrate conclusively, that depletion of proteins from a complex mixture using IgY is highly reproducible. The sample variation even when experiments were not performed on the same day was very low (p < 0.01) (Figure 1a) with overlaid chromatograms demonstrating this (Figure 1b,c). This demonstrates the molecular stability of IgY and its ability to retain its properties consistently making it an attractive reliable addition to clinical research. Figure 1: a) Graph demonstrating the reproducibility of depletion for each of the plasma samples analysed. Each sample was analysed in triplicate (p < 0.01). b) Overlaid chromatogram of human plasma depletion demonstrating reproducibility. The flow though (FT) and bound (B) fractions were collected for analysis. c) Overlaid chromatogram from cane toad plasma demonstrating very low binding of proteins to the API column. The phylogenetic relationships between organisms are one of the most important goals of evolutionary biology but elucidating those relationships have proven to be complex and difficult as the criteria used often contradict each other. Earlier studies in this regard were based on morphology or physiology but the introduction of molecular methodologies such as DNA hybridization and 16S rRNA[16,17] and the more recent advances such as sequencing of entire genome of many organisms (NCBI Genome database 2012) has allowed determination of evolutionary relationships among different organisms based upon large numbers of different gene/protein sequences using a variety of approaches. The even more recent emergence of microRNA studies for instance, have shuffled around traditional phylogenetic relationships with considerable reaction from the scientific community[18,19]. Several more recent studies have argued that protein based phylogenetic tree estimations may be more reliable and robust than other traditional methods reviewed by Bhandari, et al.. 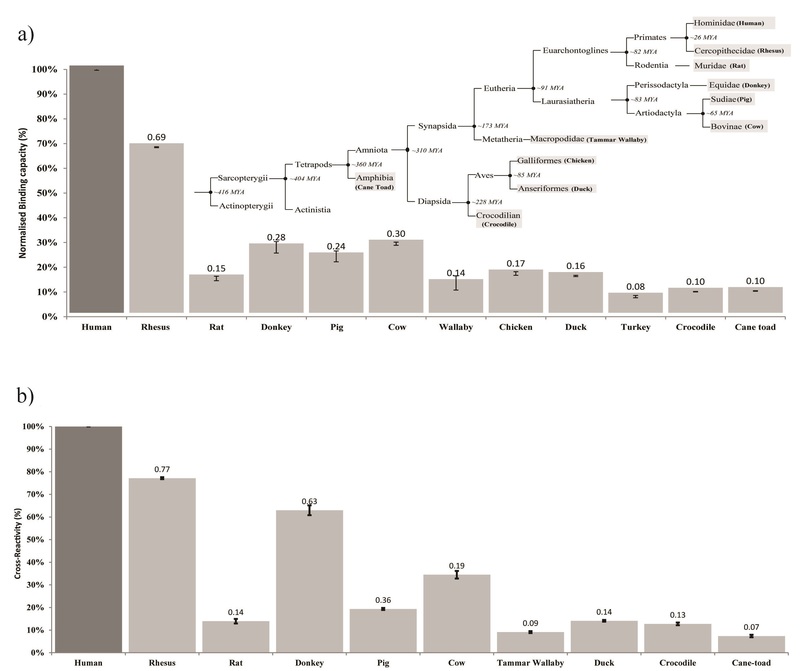 Although there may be merit in each approach, our results reflect a protein and micro RNA family tree for the mammals studied putting rodents further away from human than other mammals as the binding of rat plasma proteins to the API column was as low as distantly related species (Figure 2a). Although this phenomenon could be partially explained by the relationship between rates of reproduction and subsequent evolution it cannot be explained entirely by this phenomenon. We attempted to determine the evolutionary relationship and estimated divergence times (millions of years ago) of selected animals based on published studies[22-25] (Figure 2). Our data demonstrates the level of binding of proteins to the API column decreased as a function of phylogenetic distance with the least binding observed in the birds (Aves), reptile and amphibians an indication that the conservation of the 3D structure of proteins is significantly different as phylogenetic distance increases.This fact can be used for future experimental validation of the structural validation of phylogenetic trees. Furthermore, an ELISA study recapitulated the results obtained on the API column (Figure 2b). Figure 2: a): Binding capacity (based on area under the curve for the bound fraction) normalised against the binding capacity of human plasma on the API column. The binding of the rat plasma was considerably lower than the phylogenetic distance. b) Cross reactivity (based on intensity of signal) normalised against ELISA of reaction between human plasma and its corresponding IgY. Again the cross reactivity of rat plasma was observed to be lower than expected recapitulating the depletion column results. The ELISA was not carried out on turkey and chicken due to unavailability of sample though the duck sample represents the family. Embedded: The evolutionary tree and estimated divergence times (millions of years ago) of selected animals based on published studies[22-25]. A 1D gel analysis of the resulting bound and flow through fractions demonstrated that the anti-human IgY was able to selectively deplete a significant quantity of albumin and immunoglobulin’s (light and heavy chains) from unfractionated plasma (Figure 3) from mammalian plasma samples (indicated by arrows). The depletion of rat plasma demonstrated the results shown from the API and ELISA. 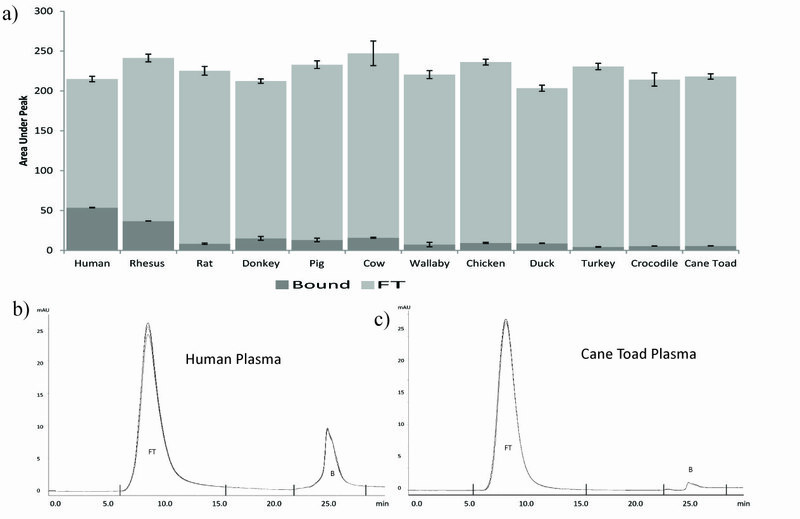 Almost no bound proteins were observed from the bird, amphibian and reptile classes although a small amount of bound proteins were observed in the chicken and duck bound plasma fractions. Figure 3: One Dimensional gel showing the unfractionated, flow through and bound fractions of animal plasma tested. Arrows in the human plasma sample indicate locations of albumin and the light and heavy chains of the immunoglobulins. A small amount of cross reaction with chicken and duck plasma was also observed. In this study we have demonstrated the cross reactivity of IgY generated against human plasma with those of plasma for a variety of animals. We demonstrate the notion that phylogenetic distance is correlated with immunogen activity and that IgY is an effective immunogen to deplete plasma of HAPs. These findings would make IgY and depletion technologies far more applicable and accessible to a wider variety of research settings. We further stipulate that chicken antibody responses could possibly be used as an effective tool to estimate experimentally, the phylogenetic relationship between animals making the utility of some animals in research for instance more viable and useful than others. The authors would like to acknowledge the ARC Linkage Program (LPO455692) and China-NSW Government Collaborative Research Program for grant funding. The authors declare no conflict of interest and/or commercial involvement in any product mentioned in this manuscript. 1. Liu, T., Qian, W.J., Mottaz, H.M., et al. Evaluation of multiprotein immunoaffinity subtraction for plasma proteomics and candidate biomarker discovery using mass spectrometry. (2006) Mol Cell Proteomics 5(11): 2167-2174. 2. Jacobs, J.M., Adkins, J.N., Qian, W.J., et al. Utilizing human blood plasma for proteomic biomarker discovery. (2005) J Proteome Res 4(4): 1073-1085. 3. Zhang, Q., Faca, V., Hanash, S. Mining the plasma proteome for disease applications across seven logs of protein abundance. (2011) J Proteome Res 10(1): 46-50. 4. Pieper, R., Su, Q., Gatlin, C.L., et al. Multi-component immunoaffinity subtraction chromatography: an innovative step towards a comprehensive survey of the human plasma proteome. (2003) Proteomics 3(4): 422-432. 5. Polaskova, V., Kapur, A., Khan, A., et al. High-abundance protein depletion: comparison of methods for human plasma biomarker discovery. (2010) Electrophoresis 31(3): 471-482. 6. Carlander, D., Stalberg, J., Larsson, A. Chicken antibodies: a clinical chemistry perspective. Ups J Med Sci (1999) 104(3): 179-189. 7. Karlsson, M., Kollberg, H., Larsson, A. Chicken IgY: utilizing the evolutionary advantage. (2004) World Poultry Sci J 60(3): 341-347. 8. Shimizu, M., Nagashima, H., Sano, K., et al. Molecular stability of chicken and rabbit immunoglobulin G. (1992) Biosci Biotechnol Biochem 56(2): 270-274. 9. Tan, S.H., Mohamedali, A., Kapur, A., et al. A novel, cost-effective and efficient chicken egg IgY purification procedure. (2012) J Immunol Methods 380(1-2): 73-76. 10. Zhou, J.Y., Petritis, B.O., Petritis, K., et al. Mouse-specific tandem IgY7-SuperMix immunoaffinity separations for improved LC-MS/MS coverage of the plasma proteome. (2009) J Proteome Res 8(11): 5387-5395. 11. Qian, W.J., Kaleta, D.T., Petritis, B.O., et al. Enhanced detection of low abundance human plasma proteins using a tandem IgY12-SuperMix immunoaffinity separation strategy. (2008) Mol Cell Proteomics 7(10): 1963-1973. 12. Cellar, N.A., Kuppannan, K., Langhorst, M.L., et al. Cross species applicability of abundant protein depletion columns for ribulose-1,5-bisphosphate carboxylase/oxygenase. (2008) J Chromatogr B Analyt Technol Biomed Life Sci 861(1): 29-39. 13. Magagnotti, C., Fermo, I., Carletti, R.M., et al. Comparison of different depletion strategies for improving resolution of the human urine proteome. (2010) Clin Chem Lab Med 48(4): 531-535. 14. Tan, S.H., Mohamedali, A., Kapur, A., et al. Ultradepletion of human plasma using chicken antibodies: a proof of concept study. (2013) J Proteome Res 12(6): 2399-2413. 15. Gassmann, M., Thommes, P., Weiser, T., et al. Efficient production of chicken egg yolk antibodies against a conserved mammalian protein. (1990) Faseb J 4(8): 2528-2532. 16. Zuckerkandl, E., Pauling, L. Molecules as documents of evolutionary history. (1965) J Theor Biol 8(2): 357-366. 17. Woese, C.R., Fox, G.E. Phylogenetic structure of the prokaryotic domain: the primary kingdoms. (1977) Proc Natl Acad Sci USA 74(11): 5088-5090. 18. Wheeler, B.M., Heimberg, A.M., Moy, V.N., et al. The deep evolution of metazoan microRNAs. (2009) Evol Dev 11(1): 50-68. 19. Dolgin, E. Phylogeny: Rewriting evolution. (2012) Nature 486(7404): 460-462. 20. Bhandari, V., Naushad, H.S., Gupta, R.S. Protein based molecular markers provide reliable means to understand prokaryotic phylogeny and support Darwinian mode of evolution. (2012) Front Cell Infect Microbiol 2: 98. 21. Berg T.J., Stryer, J.M. Evolution Requires Reproduction, Variation, and Selective Pressure. Biochemisty. 22. Blair Hedges, S., Kumar, S. Genomic clocks and evolutionary timescales. (2003) Trends Genet 19(4): 200-206. 23. Hedges, S.B. The origin and evolution of model organisms. (2002) Nat Rev Genet 3(11): 838-849. 24. Springer, M.S., Murphy, W.J., Eizirik, E., et al. Placental Mammal Diversification and the Cretaceous-Tertiary Boundary. (2003) Proc Natl Acad Sci USA 100(3): 1056-1061. 25. Murphy, W.J., Eizirik, E., Johnson, W.E., et al. Molecular phylogenetics and the origins of placental mammals. (2001) Nature 409: 614-618.